A paravertebral block is essentially a unilateral block of the spinal nerve, including the dorsal and ventral rami, as well as the sympathetic chain ganglion. These blocks can be performed at any vertebral level. However, they are most commonly performed at the thoracic level because of anatomic considerations. Therefore, this topic primarily focuses on thoracic paravertebral blockade. The clinician may consider thoracic paravertebral blockade over thoracic epidural analgesia in patients for whom bilateral sympathectomy and subsequent hypotension would be especially detrimental. [3, 4, 5] For example, the use of thoracic paravertebral blockade in a patient with severe aortic stenosis has been reported. In another study, thoracic paravertebral blockade resulted in more stable hemodynamics and equivalent analgesia when compared to thoracic epidural analgesia in thorocotomy patients. However, because bilateral spread can occur  , which may cause hemodynamic compromise similar to epidural blockade. The thoracic paravertebral space is a triangular- or wedge-shaped space running the length of the thoracic vertebral column bilaterally (see the image below). Anatomy of the thoracic paravertebral space (outlined in dashed red line). 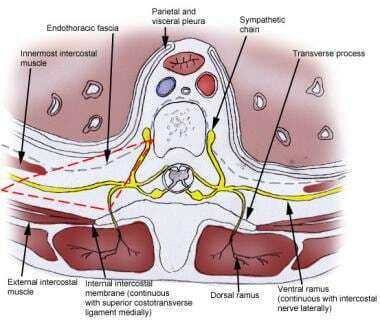 It is bounded posteriorly by the superior costotransverse ligament (a continuation of the internal intercostal muscle); anteriolaterally by the parietal pleura; and medially by the vertebral bodies, intervertebral foramina, and the intervertebral discs. In contrast to cervical and lumbar regions, the thoracic paravertebral space is in continuity with adjacent vertebral levels, allowing for spread of local anesthetic. This anatomic property explains why the thoracic paravertebral space may have more utility than cervical or lumbar paravertebral blocks. Failure rate may be lower with ultrasound, but this has not been studied. The patient should be consented for the procedure. The risks, benefits, and alternatives should be adequately discussed. Supplies for single shot paravertebral block. Note that 0.5% bupivacaine will last approximately 12-18 hours. The thoracic paravertebral space is highly vascular and rapid systemic absorption can occur. The block may be done with local anesthetic infiltration and sedation or under general anesthesia. Midazolam and fentanyl may be titrated to patient comfort. The patient may be positioned prone, lateral, or sitting. Patients should be monitored for at least 30 minutes after the block for signs of local anesthetic toxicity, hypotension, or other complications. Examples of thoracic paravertebral block using sagittal and transverse imaging are shown in the following videos. Thoracic paravertebral block using sagittal imaging. 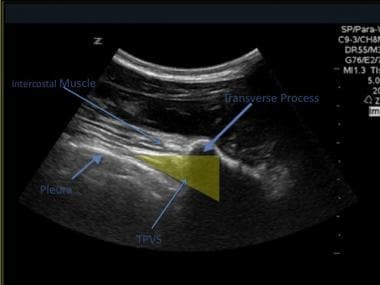 Thoracic paravertebral block using transverse imaging. Intravenous access should be obtained and standard monitors applied, including pulse oximetry, blood pressure, and electrocardiograph. The patient is positioned, sedated, prepped, and draped, as shown in the image below. Patient positioned lateral with sagittal imaging. 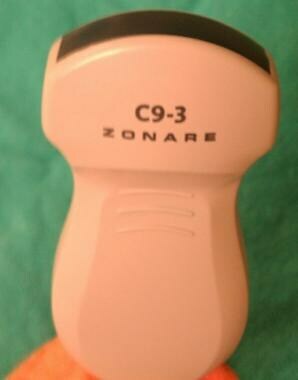 A small curvilinear or high frequency linear probe is used for ultrasound guidance (see the image below). A sagittal or transverse image can be obtained at the appropriate vertebral level. See the images below. Transverse imaging at the level of the rib. 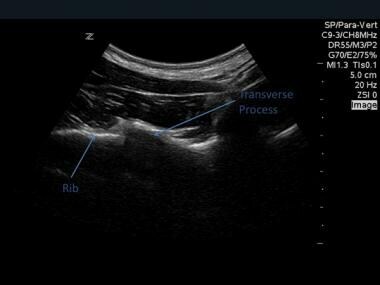 Transverse imaging at the correct level between two rib spaces. After image optimization, the skin is anesthetized with lidocaine. The Tuohy needle is advanced in plane until the tip rests in the thoracic paravertebral space. Needle visualization is sometimes difficult due to the steep angle of insonation. Injection of small amounts of fluid (hydrodissection) will aid in needle tip location. 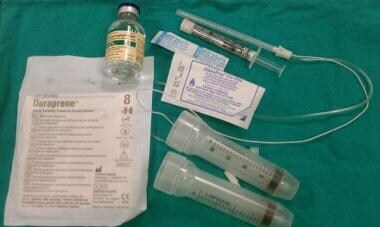 Saline or local anesthetic is injected through the Tuohy needle. The endpoint for a successful block is anterior displacement of the pleura. The catheter is threaded through the Tuohy needle and its position is confirmed by injecting local anesthetic or small air bubbles. Pleural depression should again be noted. Intravenous access should be obtained and standard monitors applied including: pulse oximetry, blood pressure, and electrocardiogram. The patient is positioned, sedated, prepped, and draped. The spinous processes of the levels to be blocked are identified and marked. The needle is inserted 2.5-3 cm lateral to the spinous process perpendicular to all planes of the skin. Using a low resistance syringe, a loss of resistance will be felt when the needle tip passes through the superior costotransverse ligament and enters the paravertebral space. The local anesthetic is injected and, if desired, a catheter is threaded. Eid HEA. Paravertebral block: An overview. Curr Anaesth Crit Care. 2009. 20:65-70. Richardson J, Lönnqvist PA, Naja Z. Bilateral thoracic paravertebral block: potential and practice. Br J Anaesth. 2011 Feb. 106(2):164-71. [Medline]. Bigeleisen PE, Goehner N. Novel approaches in pain management in cardiac surgery. Curr Opin Anaesthesiol. 2015 Feb. 28 (1):89-94. [Medline]. Koyyalamudi VB, Arulkumar S, Yost BR, Fox CJ, Urman RD, Kaye AD. Supraclavicular and paravertebral blocks: Are we underutilizing these regional techniques in perioperative analgesia?. Best Pract Res Clin Anaesthesiol. 2014 Jun. 28 (2):127-38. [Medline]. Baidya DK, Khanna P, Maitra S. Analgesic efficacy and safety of thoracic paravertebral and epidural analgesia for thoracic surgery: a systematic review and meta-analysis. Interact Cardiovasc Thorac Surg. 2014 May. 18 (5):626-35. [Medline]. Serpetinis I, Bassiakou E, Xanthos T, Baltatzi L, Kouta A. Paravertebral block for open cholecystectomy in patients with cardiopulmonary pathology. 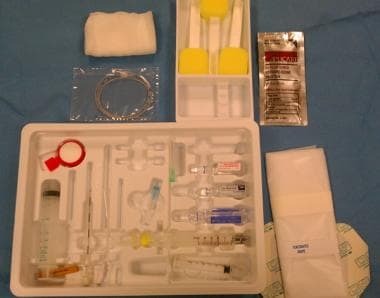 Acta Anaesthesiol Scand. 2008 Jul. 52(6):872-3. [Medline]. Pintaric T, Potocnik I, Hadzic A, Stupnik T, Pintaric M, Jankovic V. Comparison of Continuous Thoracic Epidural With Paravertebral Block on Perioperative Analgesia and Hemodynamic Stability in Patients Having Open Lung Surgery. Regional Anesthesia and Pain Medicine. May-June/11. 36:256-60. Karmakar MK, Kwok WH, Kew J. Thoracic paravertebral block: radiological evidence of contralateral spread anterior to the vertebral bodies. Br J Anaesth. 2000 Feb. 84(2):263-5. [Medline]. Karmakar MK, Ho AM, Law BK, Wong AS, Shafer SL, Gin T. Arterial and venous pharmacokinetics of ropivacaine with and without epinephrine after thoracic paravertebral block. Anesthesiology. 2005 Oct. 103(4):704-11. [Medline]. Karmakar MK. Thoracic paravertebral block. Anesthesiology. 2001 Sep. 95(3):771-80. [Medline]. Greengrass R, O'Brien F, Lyerly K, Hardman D, Gleason D, D'Ercole F, et al. Paravertebral block for breast cancer surgery. Can J Anaesth. 1996 Aug. 43(8):858-61. [Medline]. Wheeler LJ. Peripheral nerve stimulation end-point for thoracic paravertebral block. Br J Anaesth. 2001 Apr. 86(4):598-9. [Medline]. Hara K, Sakura S, Nomura T, Saito Y. Ultrasound guided thoracic paravertebral block in breast surgery. Anaesthesia. 2009. 64:223-5. Culp WC, McCowan TC, DeValdenebro M, Wright LB, Workman JL, Culp WC Jr. Paravertebral block: an improved method of pain control in percutaneous transhepatic biliary drainage. Cardiovasc Intervent Radiol. 2006 Nov-Dec. 29(6):1015-21. [Medline]. Lönnqvist PA, MacKenzie J, Soni AK, Conacher ID. Paravertebral blockade. Failure rate and complications. Anaesthesia. 1995 Sep. 50(9):813-5. [Medline]. Disclosure: Serve(d) as a director, officer, partner, employee, advisor, consultant or trustee for: Pacira pharmaceuticals.